During this time God graciously raised up "judges" (shophetim) who reversed the status quo for a season by calling on God and rallying the people around the One who had chosen them and commissioned them to occupy the land. David ruled as king for seven years from Hebron (2 Samuel 2:11, 1 Chronicles 3:4), then established his throne in Jerusalem after overcoming the ancient Jebusite (Canaanite) community there. His reign continued there in Jerusalem for the next 32 years. Secure on his throne and dwelling in a magnificent palace of cedar and stone, David began to be concerned that he, the visible king, dwelled in a magnificent house, but the invisible King of kings still dwelt in an aging temporary tent, the Tabernacle of Moses. Late in his reign David carelessly chose to take a census of the army acting against the advice of General Joab and other army leaders. The Lord was provoked to great anger at David who evidently had forgotten that the strength of Israel was in her God and not in the number of her soldiers or skill in battle. Confronted with the seriousness of his poor judgment by the prophet Gad, David was given three choices by God as to the consequences that were to follow this serious mistake on the part of the king. The three choices given him were (1) three years of famine, (2) three years of devastation by Israel's foes, or (3) of three days of destruction (pestilence) wrought by The Angel of the Lord, (see 1 Chr. 21, 2 Sam 24 for the accounts). And Gad came that day to David and said to him, "Go up, erect an altar to the Lord on the threshing floor of Araunah the Jebusite." . . . And David built there an altar unto the Lord, and offered burnt offerings and peace offerings. So the Lord heeded the prayers for the land, and the plague was withdrawn from Israel. (2 Samuel 24:15, 16, 18, 25). 1. Solomon Steckoll, The Temple Mount, Tom Stacey Ltd., London, 1972. 2. Zev Vilnay, Legends of Jerusalem, Jewish Publication Society of America, Philadelphia, 1973. 3. Steve Austin, The Extraordinary Middle East Earthquake of 750 BC, Institute of Creation Research, San Diego, 1989. 4. 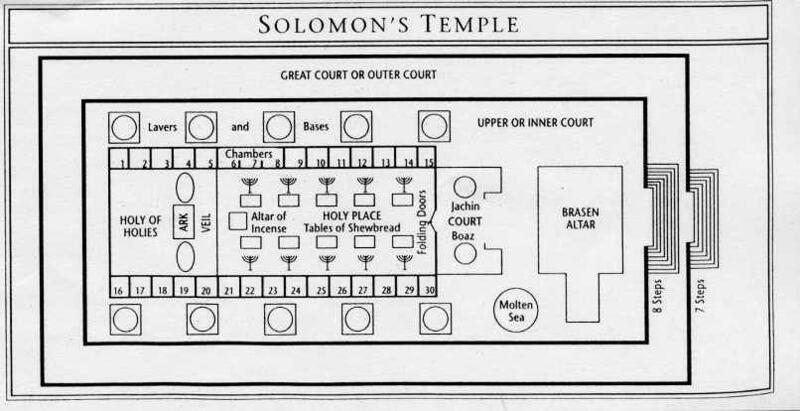 In response to a question about the actual dates for the First and Second Temples the following brief comments are offered: Solomon spent 13 years building his own house and seven years building the First Temple ("Solomon's Temple"). It was twice the size of the Tabernacle and was finished in the Jewish month of Bul, 960 BC. 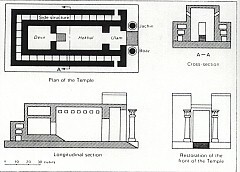 I Kings and II Chronicles describes the building of the temple in detail. 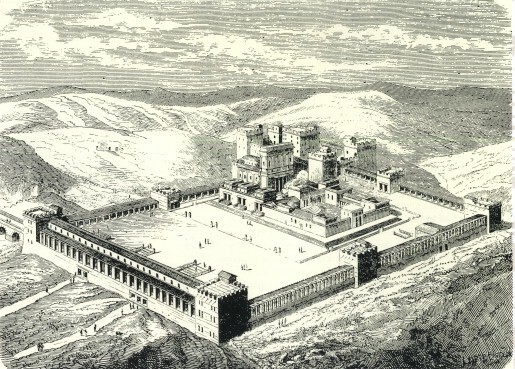 This temple was totally destroyed by the Babylonians led by King Nebuchadnezzar. That occurred on the 9th day of Av, 586 BC. That means the First Temple stood for 374 years. At the end of the 70 years captivity of the Jews in Babylon, the Medes and Persians who conquered Babylon allowed the Jews to return to Jerusalem, first to build a new temple and later to rebuild the walls of the city. (See Ezra, Haggai, Nehemiah). 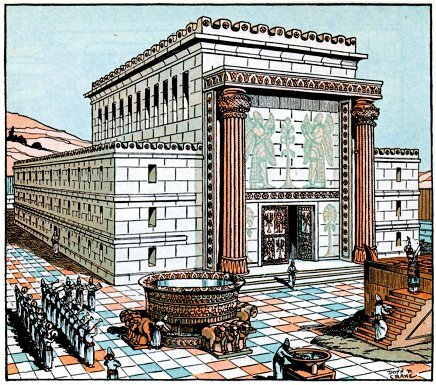 The foundation of the Second Temple was laid in 535 BC and finally finished (after delays) on March 12, 515 BC. Persian rule over the area was replaced by Greek control and then Roman. Herod the Great was ruler of Israel under the Romans from about 47 BC to 4 BC. He built extensively around the country and greatly enlarged the Second Temple, its courts and walls. 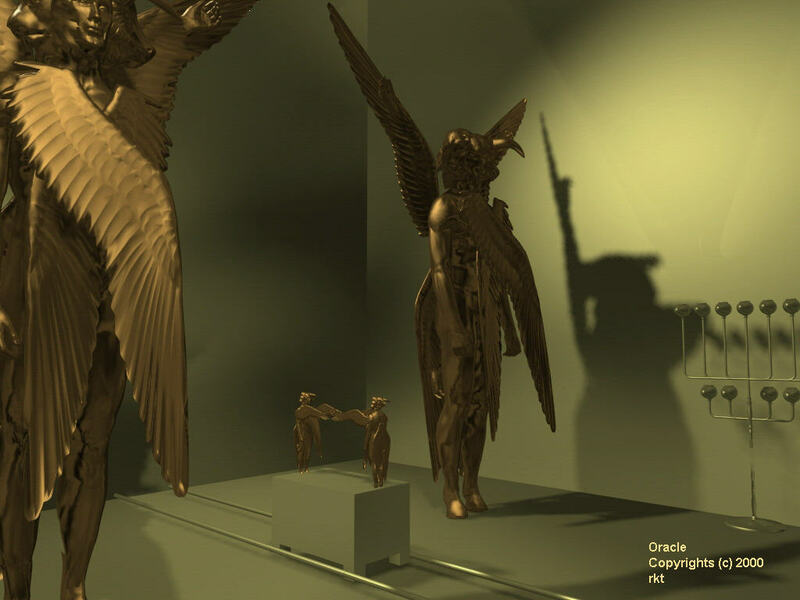 The work was begun in 20 BC and continued well beyond Herod's death to 63 AD. Jewish revolts against the Romans in 70 AD caused the Roman General Titus (later to become Caesar) to beseige the city. 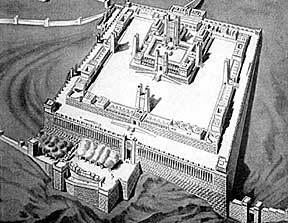 The second Temple was totally destroyed by fire on the 9th of Av, 70 AD. Thus that temple (with its enlargements was in service about 584 years.